Following the fire that destroyed the yacht “Lalibela” late on Friday night, the management of the port Camille Rayon would like to thank all those who intervened very quickly to contain and extinguish the fire and to limit the risks of pollution in the port. Fire remains one of the major risk in a port and the greatest fear of captains. Unfortunately, that is what happened last Saturday around 3am on board a yacht flying Maltese flag and moored on the south quay. The alert was raised by a port officer working night shift who contacted the harbour masters and the rest of the officers. All the agents off-duty or on leave came spontaneously to lend aid in the night. 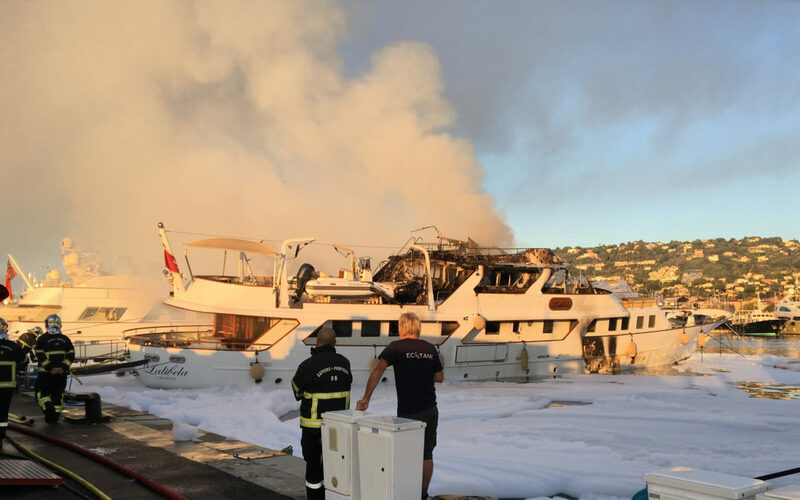 The team of the port Camille Rayon responded immediately, following the emergency response plan starting with the isolation of the boat to avoid the spreading of the fire. Most of the crews were ready to evacuate, despite this, two 45 meters’ yachts had to be towed and secured. Then, they deployed a no pollution boom around “Lalibela”. The team of the port acted as one with the firefighters and the supervisors of the ports of Golfe- Juan – Vallauris so everyone could work safely in the best conditions. This faultless cooperation has allowed to concentrate the oil spills around the “Lalibela” before the company Eco Tank started pumping with an “oléophilic skimmer”, a small machine with filter discs that separate water from gaz oil. As for the tanks of the yacht , they have been emptied by the tank trucks of the company SE.RA.HU. Pumping should be over by tonight. The next step will be the grounding and subsequent wreck removal towards a ship yard. In the meantime, the whole team of the Port Camille Rayon is keeping an eye on “Lalibela” and watch out for pollution 24/7. The management of The Port Camille Rayon .